HIGH CHAPARRAL (IRE) (Bay 1999-Stud 2004). 10 wins-2 at 2, The Derby, Gr.1. Champion Aust. Sire (AEI) twice. Sire of 1744 rnrs, 1104 wnrs, 128 SW, inc. So You Think (MVRC WS Cox P., Gr.1), Dundeel, Shoot Out, Ace High, Descarado, Monaco Consul, Rekindling, Contributer, Toronado, Wigmore Hall, Lucky Lion, Free Eagle, Tivaci, Redwood, Hiyaam, Youngstar, Charmont, Fenway, High Jinx, Montoya's Secret, Pondarosa Miss, Wrote, Joanna, Enaad, etc. FREE EAGLE (c by High Chaparral) 3 wins. See below. CUSTOM CUT (g by Notnowcato) Joint Champion Older Male Miler in Ireland in 2015. 13 wins from 7f to 9f, £331,811, €360,970, Newmarket Joel S., Gr.2, Leopardstown Solonaway S., Gr.2, Sandown Mile S., Gr.2, York Strensall S., Gr.3, Leopardstown Amethyst S., Gr.3, Desmond S., Gr.3, Curragh Gladness S., Gr.3, Windsor Midsummer S., L, Pontefract Pomfret S., L, Curragh D&M Trucks Kilcullen H., 2d Leopardstown Solonaway S., Gr.2, Newmarket Joel S., Gr.2, Epsom Diomed S., Gr.3, Curragh Gladness S., Gr.3, Leopardstown Amethyst S., Gr.3, Haydock Spring Trophy, L, Pontefract Pomfret S., L, 3d York Strensall S., Gr.3, Epsom Diomed S., Gr.3, Leopardstown Desmond S., Gr.3, Salisbury Sovereign S., Gr.3, York Ganton S., L, Doncaster Mile, L-twice, Galway Topaz Mile H., 4th Ascot Summer Mile, Gr.2, York S., Gr.2, Haydock Superior Mile, Gr.3, Newmarket Earl of Sefton S., Gr.3, Leopardstown Desmond S., Gr.3-twice, Curragh Waterford Testimonial S., L.
Jewel Maker. Winner at 7f in 2018 in Ireland. Falcon Eight (c by Galileo) 2 wins at 11¼f, 1½m in 2018, Curragh Hanlon Concrete S., 3d Naas Loughbrown S., Gr.3. Valac (g by Dark Angel) 6 wins from 1400m to 2250m, €7,235, A$180,700, to 2018-19, SAJC Medallion Homes H., 2d VRC Furphy Ale H., Leopardstown Bulmers Live S., SAJC 36degrees South H.
Rich History (c by Dubawi) 3 wins at 1700m, 2000m in Qatar. Lightning Amber. Winner at 2 in 2018, Leopardstown Irish Stallion Farms 2YO Fillies S., 3d Curragh Irish Stallion Farms 2YO Fillies S.
Moved. 2 wins at 3000m in 2018, 3d Pisa Criterium d'Inverno Hurdle, Corsa Siepi dei 4 Anni. DRESS TO THRILL (f Danehill) 7 wins-1 at 2-from 7f to 9f, £104,746, €136,503, US$487,780, Hollywood Park Matriarch S., Gr.1, Newmarket Sun Chariot S., Gr.2, Leopardstown Desmond S., Gr.3, Matron S., Gr.3, Colonial Downs All Along S., Gr.3, Leopardstown Brownstown Stud S., L, Curragh Tyros S., L, 2d Curragh Moyglare Stud S., Gr.1, 4th Belmont Flower Bowl S., Gr.1. Producer. Act of Defiance (g Caerleon) 6 wins-1 at 2-from 6f to 17f, 3d Curragh Tyros S., L.
LOVE LOCKDOWN (g Verglas) 4 wins at 2, Kempton Sirenia S., Gr.3, Cork Rochestown S., L, Leopardstown Irish Stallion Farms 2YO S., 2d HKJC BMW Performance Race H., 3d York Roses S., L, HKJC Chaozhou H.
TABLE ROCK - ANTICIPATION (H.K.) (g Fastnet Rock) 5 wins from 1600m to 2000m, £22,684, €57,340, HK$4,082,800, Newmarket Sir Henry Cecil S., L, Curragh Done Deal H., Newstalk S., 2d HKJC Queen Mother Memorial Cup, L.
VERT DE GRECE - THE MONARCH (H.K.) (c Verglas) 2 wins at 2, €176,035, HK$57,750, Saint-Cloud Criterium International, Gr.1, 2d Curragh Futurity S., Gr.2, Leopardstown Famous Name 2YO S.
Joint Champion Older Horse in Europe & Ireland in 2015 (Int.). HIGH CHAPARRAL Champion 3YO Colt in GB & Ireland in 2002 (Long). Champion Grass Male in USA in 2002 & 2003. Champion Older Male in Ireland in 2003 (Int./Long). 10 wins-2 at 2-from 7f to 1½m, £923,996, €1,879,797, US$2,021,600, Leopardstown Irish Champion S., Gr.1, The Derby, Gr.1, Irish Derby, Gr.1, Breeders' Cup Turf, Gr.1-twice, Doncaster Racing Post Trophy, Gr.1, Curragh Royal Whip S., Gr.2, Leopardstown Derby Trial S., Gr.3, Ballysax S., L, 3d Prix de l'Arc de Triomphe, Gr.1-twice. He entered stud in Ireland in 2004. He entered stud in NZ in 2005. Champion Aust. Sire (AEI) in 2009-10, 2010-11. Leading NZ Sire (Aust. & NZ comb.) in 2010-11, second in 2009-10. Champion Sire in Czech Republic in 2014. Sire of 1744 progeny to race, 1104 winners (63.0%), earnings of over $145 million, 128 stakes winners, 70 stakes placegetters, inc. SO YOU THINK (06c, Tights, Long Row). Champion 3YO Colt in Australia in 2009-10. Champion Miler in Australia in 2010-11. Champion Older Horse in Ireland in 2011 & 2012 (Int. ).14 wins-1 at 2-from 1400m to 2100m, £875,970, €970,425, A$5,734,350, 1,835,000Dhs, Leopardstown Irish Champion S., Gr.1, MVRC WS Cox P., Gr.1-twice, VRC LKS Mackinnon S., Gr.1, Royal Ascot Prince of Wales's S., Gr.1, Sandown Eclipse S., Gr.1, Curragh Tattersalls Gold Cup, Gr.1-twice, MRC Yalumba S., Gr.1, Underwood S., Gr.1, Memsie S., Gr.2, Curragh Mooresbridge S., Gr.3, STC Gloaming S., Gr.3, Freeway Hotel Artarmon 2YO H., 2d Ascot Champion S., Gr.1, VRC Emirates S., Gr.1, Royal Ascot Prince of Wales's S., Gr.1, AJC Ming Dynasty H., L, 3d VRC Melbourne Cup, Gr.1, 4th Longchamp Prix de l'Arc de Triomphe, Gr.1, Meydan Dubai World Cup, Gr.1. DUNDEEL (09c, Zabeel, Fiesta Star). Horse of the Year in NZ in 2013-14. 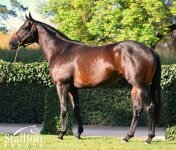 Champion 3YO in NZ in 2012-13. Champion Middle Distance Male in Australia & NZ in 2013-14.10 wins-1 at 2-from 1200m to 2400m, NZ$7,550, A$5,386,160, ATC Queen Elizabeth S., Gr.1, Australian Derby, Gr.1, Rosehill Guineas, Gr.1, Randwick Guineas, Gr.1, Spring Champion S., Gr.1, MRC Underwood S., Gr.1, ATC Gloaming S., Gr.3, Allan Denham Racing H., Australian Turf Club H., 2d ATC BMW S., Gr.1, Queen Elizabeth S., Gr.1, Chipping Norton S., Gr.1, MVRC Mitchelton Wines Vase, Gr.2, 3d ATC Ranvet S., Gr.1, 4th MRC Memsie S., Gr.1, ATC Hobartville S., Gr.2. SHOOT OUT (06g, Pentire, Virginia Privateer). Champion 3YO Stayer in Australia in 2009-10.10 wins-2 at 2-from 1200m to 2400m, A$3,238,950, Australian Derby, Gr.1, ATC Chipping Norton S., Gr.1-twice, George Main S., Gr.1, AJC Randwick Guineas, Gr.1, Royal Sovereign S., Gr.2, QTC Sires' Produce S., Gr.2, MRC JJ Liston S., Gr.2, Bletchingly S., Gr.3, 2d ATC Doncaster H., Gr.1, Apollo S., Gr.2, BRC Eagle Farm Cup, Gr.2, STC Hobartville S., Gr.2, BRC Vo Rogue P., Gr.3, 3d VRC Turnbull S., Gr.1, ATC George Ryder S., Gr.1, Ranvet S., Gr.1, Expressway S., Gr.2, MVRC Dato' Tan Chin Nam S., Gr.2, MRC Memsie S., Gr.2, 4th MVRC WS Cox P., Gr.1, VRC LKS Mackinnon S., Gr.1, STC Rosehill Guineas, Gr.1. CONTRIBUTER (10c, Exit to Nowhere, Royal Academy). 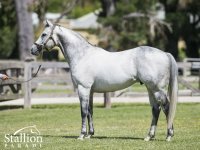 Champion Miler in Australia in 2014-15.8 wins-1 at 2-from 1400m to 2000m, £109,264, A$988,700, ATC Chipping Norton S., Gr.1, Ranvet S., Gr.1, Apollo S., Gr.2, MRC David Jones Cup, Gr.3, Royal Ascot Wolferton H., L, Kempton Magnolia S., L, Newbury Dubai Duty Free Golf World Cup S., 2d Chester Dee S., Gr.3, Goodwood Cocked Hat S., L, 3d VRC LKS Mackinnon S., Gr.1, Sandown Gordon Richards S., Gr.3, 4th Royal Ascot King Edward VII S., Gr.2. TORONADO (10c, Grand Slam, Always Fair). Equal Leading 3YO Male on the 2013 WTR (Mile). Joint Champion 3YO Miler in Europe in 2013. Joint Champion 3YO Miler in GB in 2013.6 wins-3 at 2-from 6½f to 1m, £668,356, €102,870, Goodwood Sussex S., Gr.1, Royal Ascot Queen Anne S., Gr.1, Doncaster Champagne S., Gr.2, Newmarket Craven S., Gr.3, Ascot Winkfield S., L, Newbury Outward Bound Trust 2YO S., 2d Royal Ascot St James's Palace S., Gr.1, Goodwood Sussex S., Gr.1, Prix du Moulin de Longchamp, Gr.1, 4th The Two Thousand Guineas, Gr.1. ACE HIGH (14c, Redoute's Choice, Sunday Silence). 5 wins-1 at 2-from 1400m to 2500m to 2018-19, A$2,269,325, VRC Victoria Derby, Gr.1, ATC Spring Champion S., Gr.1, Hill S., Gr.2, Gloaming S., Gr.3, 2d ATC Australian Derby, Gr.1, NSW Tatt's RC Chelmsford S., Gr.2, ATC Pierro 2YO P., 3d MRC Peter Young S., Gr.2, 4th ATC Randwick Guineas, Gr.1, Champagne S., Gr.1, George Main S., Gr.1. WIGMORE HALL (07g, Theatrical, Sri Pekan). Champion 3YO Colt in GB in 2010 (9½f-11f).7 wins-1 at 2-from 1600m to 2400m, £200,092, €17,130, US$841,733, 3,331,520Dhs, Woodbine Northern Dancer Turf S., Gr.1-twice, Meydan Jebel Hatta S., Gr.2, York John Smith's Cup, Newmarket Nights S., Book for the Irish Classics H., MC Seafood 2YO S., 2d Arlington Park Secretariat S., Gr.1, Newmarket Godolphin S., L, Newmarket S., L, Doncaster Sportingbet.com S., Wilson Field Neurocare S., Newmarket Betfair Supports Racing Welfare H., 3d Meydan Dubai Duty Free S., Gr.1, Newmarket Jockey Club S., Gr.2, York S., Gr.2, Chester Huxley S., Gr.3, Royal Ascot Hampton Court S., L, 4th Woodbine Canadian International S., Gr.1, Longchamp Prix Ganay, Gr.1, Arlington Million S., Gr.1, Meydan Dubai Duty Free, Gr.1. DESCARADO (06g, Lord Ballina, Forty Winks II). 5 wins from 1200m to 2400m, NZ$28,813, A$2,577,900, MRC Caulfield Cup, Gr.1, Caulfield S., Gr.1, STC Hill S., Gr.2, 2d Australian Derby, Gr.1, VRC LKS Mackinnon S., Gr.1, ATC Ranvet S., Gr.1, STC Tulloch S., Gr.2, Wellington Guineas, Gr.2, CJC Guineas Trial, 3d STC Phar Lap S., Gr.2. MONACO CONSUL (06c, Star Way, In the Purple). 3 wins from 1400m to 2500m, NZ$23,800, A$1,470,300, Victoria Derby, Gr.1, AJC Spring Champion S., Gr.1, 3d AJC Queen Elizabeth S., Gr.1, Australian Derby, Gr.1, MRC Caulfield Cup, Gr.1. TIVACI (12c, Fastnet Rock, Military Plume). 6 wins from 1000m to 1600m, A$992,250, ATC All Aged S., Gr.1, VRC CS Hayes S., Gr.3, Sunshine Coast Guineas, Gr.3, VRC Kensington S., L, 2d VRC Bobbie Lewis H., Gr.2, UCI S., L, Pakenham RC Australian Seed & Turf H., 3d VRC Cantala S., Gr.1, MRC Toorak H., Gr.1, 4th ATC TJ Smith S., Gr.1, BRC Fred Best Classic, Gr.3. REKINDLING (14c, Salse, Ahonoora). Champion Stayer in Australia in 2017-18.4 wins-1 at 2-from 1600m to 3200m to 2017-18, £47,474, €130,933, A$3,850,000, VRC Melbourne Cup, Gr.1, Curragh Cup, Gr.2, Leopardstown Ballysax S., Gr.3, 2d Curragh Irish St Leger Trial, Gr.3, 4th The St Leger, Gr.1, York Dante S., Gr.2. REDWOOD (06c, Woodman, Lyphard). 4 wins-1 at 2-from 1m to 1½m, £129,435, €44,000, US$668,576, HK$3,080,000, 3,680,000Dhs, Woodbine Northern Dancer Turf S., Gr.1, Goodwood Glorious S., Gr.3, Newmarket Feilden S., L, 2YO S., 2d Meydan Dubai Sheema Classic S., Gr.1, Cathay Pacific Hong Kong Vase, Gr.1, Newmarket Princess of Wales's S., Gr.2-twice, Grand Prix de Deauville, Gr.2, Sandown Gordon Richards S., Gr.3, 3d Woodbine Canadian International S., Gr.1, 4th Goodwood Glorious S., Gr.3. HIGH JINX (08g, Surumu, Vitiges). 6 wins from 2400m to 4150m to 2018, £183,694, €391,720, Longchamp Prix du Cadran, Gr.1, Maisons-Laffitte Prix du Carrousel, L, Newmarket Levy Board H., 2d Longchamp Prix Royal Oak, Gr.1, Prix du Cadran, Gr.1, York Lonsdale Cup, Gr.2, Doncaster Cup, Gr.2-twice, Sandown Henry II S., Gr.3, York Silver Cup, L, 3d Yorkshire Cup, Gr.2, Longchamp Prix Gladiateur, Gr.3, Nottingham Further Flight S., L, Newmarket Burts Chips Made in Devon H., 4th Chantilly Prix du Cadran, Gr.1, Longchamp Prix de Barbeville, Gr.3, Sandown Henry II S., Gr.3. YOUNGSTAR (14f, Danehill, Slip Anchor). 4 wins from 1500m to 2200m in 2017-18, A$923,312, BRC Queensland Oaks, Gr.1, The Roses, Gr.2, 2d VRC Turnbull S., Gr.1, 3d BRC Queensland Derby, Gr.1, ATC Shannon S., Gr.2, Theraces P.
CHARMONT (11f, Danehill, Zabeel). 4 wins at 1400m, 1600m, NZ$294,750, Te Aroha JC New Zealand Thoroughbred Breeders S., Gr.1, Wairarapa Thoroughbred Breeders' S., L, WRC Direct Fish & Oysters H., 2d Waikato RC NRM H., Marton JC Central ITM H., ARC New Zealand Herald H., 3d New Zealand Oaks, Gr.1, ARC Royal S., Gr.2, Waikato RC Sir Tristram Fillies Classic, Gr.2, ARC Sunline Vase, Gr.3, WRC Cuddle S., Gr.3, Manawatu Classic, Gr.3, Hororata RC South Island Thoroughbred Breeders' S., Gr.3, Waikato RC Seafood Bazaar H., ARC OMF H., 4th ARC Eight Carat Classic, Gr.2. HIYAAM (14f, Zabeel, Gold and Ivory). 3 wins at 1400m, 2000m to 2018-19, A$739,240, ATC Vinery Stud S., Gr.1, Randwick City S., L, 2d ATC Australian Oaks, Gr.1, VRC Edward Manifold S., Gr.2, 3d VRC Oaks, Gr.1, ATC Phar Lap S., Gr.2, MRC Ethereal S., Gr.3, 4th VRC Wakeful S., Gr.2. FREE EAGLE (11c, Danehill, Affirmed). Joint Champion Older Horse in Europe & Ireland in 2015 (Int. ).3 wins-1 at 2-from 1m to 1¼m, £443,930, €185,750, Royal Ascot Prince of Wales's S., Gr.1, Leopardstown Enterprise S., Gr.3, Irish Stallion Farms 2YO S., 2d Leopardstown Golden Fleece S., Gr.3, 3d Leopardstown Irish Champion S., Gr.1, Ascot Champion S., Gr.1. FENWAY (11f, Zabeel, Danehill). 3 wins from 1400m to 2000m, A$691,600, ATC Vinery Stud S., Gr.1, MVRC WH Stocks S., Gr.2, 2d VRC Myer Classic, Gr.1, SAJC Schweppes Oaks, Gr.1, MRC Peter Young S., Gr.2, 3d VRC Wakeful S., Gr.2, 4th VRC Australian Cup, Gr.1, MVRC Sunline S., Gr.2, VRC Vanity S., Gr.3, Schweppervescence Trophy, Gr.3. PONDAROSA MISS (10f, Danske, Bakharoff). 6 wins from 1400m to 2100m, NZ$271,635, ARC Easter H., Gr.1, Coca-Cola H., Simply Squeezed H., Waikato RC The Pathways Immigration Specialists H., 2d Rotorua Challenge P., L, 3d ARC Zabeel Classic, Gr.1, Auckland Cup, Gr.1, Waikato RC Arrowfield Stud H., Kingsgate Hotel Hamilton H., 4th ARC Avondale Cup, Gr.2. MONTOYA'S SECRET (13f, Thunder Gulch, Don't Say Halo). 3 wins from 1400m to 2000m, A$432,875, ATC Vinery Stud S., Gr.1, MVRC Jeep City Hawk H., 2d VRC Pat Hyland 2YO P., MRC Ladbrokes.com.au 2YO Fillies H., MVRC William Hill P., 3d MRC Mannerism S., Gr.3. WROTE (09c, Green Desert, Kris). 3 wins at 2, £10,760, €39,170, US$544,000, 734,000Dhs, Breeders' Cup Juvenile Turf S., Gr.1, 3d Newmarket Royal Lodge S., Gr.2, Leopardstown Derrinstown Stud Derby Trial S., Gr.2, UAE Derby, Gr.2. WESTERN HYMN (11g, Cape Cross, Darshaan). 8 wins-1 at 2-from 1600m to 2700m, £542,346, €102,100, Maisons-Laffitte Prix Eugene Adam, Gr.2, Sandown Gordon Richards S., Gr.3, Brigadier Gerard S., Gr.3, Classic Trial S., Gr.3, Chester Ormonde S., Gr.3, Kempton Floodlit S., L, Newbury Dubai Duty Free Golf World Cup Stallions S., 2d Sandown Gordon Richards S., Gr.3, Brigadier Gerard S., Gr.3, Chester Huxley S., Gr.3, 3d Royal Ascot Prince of Wales's S., Gr.1-twice, Sandown Eclipse S., Gr.1, 4th Ascot Champion S., Gr.1, Deauville Prix Guillaume d'Ornano, Gr.2, Newmarket Princess of Wales's S., Gr.2, Ascot Cumberland Lodge S., Gr.3. CASCAPEDIA (14f, Dansili, Damascus). 6 wins from 1400m to 1800m to 2018-19, R1,305,350, Turffontein Johannesburg Spring Fillies & Mares Challenge, Gr.2, Yellowwood H., Gr.3, London News S., Gr.3, Supabets S., Bring and Braai in September Novice H., 2d Turffontein Hawaii S., Gr.2, Betting World S., 3d Turffontein Summer Cup, Gr.1, Kenilworth Paddock S., Gr.1. ENAAD (11c, Danehill, Artaius). Champion Stayer in South Africa in 2015-16.6 wins from 1600m to 3200m to 2018, R2,985,802, Greyville Gold Cup, Gr.2, Gold Vase, Gr.3, Mauritius TC Maiden Cup-twice, Vaal Book a Table H., 2d Mauritius TC Golden Trophy, Turf Magazine Golden Trophy, Turffontein It's a Rush Racing H., Book a Table S., Matrix H., 3d Mauritius TC Barbe Cup, 4th Turffontein Racing Association H., Gr.3. RAYMOND TUSK (15c, Danehill, Affirmed). 3 wins from 1600m to 2400m in 2018, £64,672, €99,450, Milan Gran Premio del Jockey Club, Gr.2, Hamilton Glasgow S., L, Newbury Dubai Duty Free Tennis Championships S., 2d Newbury Geoffrey Freer S., Gr.3, Newmarket Southend Airport to Dubrovnik S.
OMEI SWORD (13f, Fastnet Rock, Hennessy). 2 wins-1 at 2-at 1100m, 1200m, A$482,025, ATC Silver Shadow S., Gr.2, Peter Svendsen 2YO H., 2d ATC Golden Rose S., Gr.1, Surround S., Gr.2, Magic Night S., Gr.2, 3d ATC Golden Pendant, Gr.2. BRING ME ROSES (14f, Polish Patriot, Sir Ivor). Winner at 1600m in 2017-18, A$604,450, VRC Edward Manifold S., Gr.2, 2d VRC Empire Rose S., Gr.1, VRC Oaks, Gr.1, Vanity S., Gr.3, SAJC Morphettville Guineas, L, 3d VRC Australian Guineas, Gr.1, SAJC Oaklands P., L, 4th ATC Australian Oaks, Gr.1, MVRC Tesio S., Gr.3. HIGHLAD (13g, Arena, Marauding). 8 wins from 1200m to 2200m to 2017-18, NZ$216,875, A$40,800, Rotorua Cup, Gr.3, Wanganui Guineas, L, Waikato RC Dunstan Feeds Qualifier H., Te Aroha Cup, Hawkes Bay Congratulations HBHS First XV H., Waikato RC Doubler H., BCD H., 3d VRC UCI S., L, Rotorua Challenge P., L, Hawkes Bay Swiss Ace Trophy, BOP RC Phoenix on the Strand H.
DOLLAR FOR DOLLAR (12g, Encosta de Lago, Century). 8 wins from 1200m to 1600m to 2018-19, A$523,545, MRC Sandown S., Gr.3, SAJC Spring S., Gr.3, VRC Lavazza Short Black H., SAJC Spring Carnival H., AAMI Lucky Club H., Ballarat TC Suez McKellar Mile H., 2d MRC Sir Rupert Clarke S., Gr.1, VRC Sofitel H., L, MRC John Dillon S., L, Ladbrokes Odds Boost H., 3d VRC Chester Manifold S., L.
FABRIZIO (11g, Desert King, Prego). 8 wins from 1200m to 1800m, A$539,725, Hawkesbury Gold Cup, Gr.3, VRC James Boag's Premium S., L, ATC Theraces H., Cellarbrations H., McGrath Estate Agents H., City Tatt's RC Bartier Perry H., 2d TTC Launceston Cup, Gr.3, Goulburn Cup, 3d ATC Australia Day Cup, L, MVRC Moonee Valley Night Cup, L, Hawkesbury RC Ladies Day Cup, L, Gosford Gold Cup, L.
STAMPEDE (12c, Tale of the Cat, Nothin' Leica Dane). 7 wins from 1400m to 2000m to 2018-19, A$444,500, BRC Chairman's H., Gr.3, Murrumbidgee TC Wagga Wagga Gold Cup, L, MVRC Craig Opie Cup, ATC Star Mile H., More Than Ready at Vinery H., TAB More Than Just Winning H., 2d ATC TBNSW P., TAB Rewards H., Bowermans Furniture H., 3d MRC Naturalism S., Gr.3. PETIT CHEVALIER (08g, Pivotal, Homme de Loi). 7 wins from 1800m to 2400m, €214,100, Deauville Prix Gontaut-Biron, Gr.3, Grand Prix de Compiegne, L, Chantilly Prix de Seugy, 2d Frankfurt Hessen Pokal, Gr.3-twice, Hamburg Grosser Preis von Lotto Hamburg, Gr.3, 3d Longchamp Prix Dollar, Gr.2, Baden-Baden Preis der Sparkassen Finanzgruppe, Gr.3, Deauville Prix de la Motteraye, Prix de Pierrepont, Prix de la Fontaine Teauvillaise, Saint-Cloud Prix Mieuxce, 4th Saint-Cloud Prix Turenne, L, Le Croise-Laroche Grand Prix du Nord, L.
WESTERN SYMBOL (06g, Bluebird, Crested Wave). 6 wins from 1500m to 2400m, A$310,990, ATC Neville Sellwood S., Gr.3, Japan Racing Association P., L, Royal Randwick on Twitter H., Coogee H., West Pennant Hills Sports H., 2d ATC Craven P., Gr.3, Hawkesbury RC Rowley Mile H., L, ATC Royal Randwick on Twitter H., 3d ATC City Tattersalls Club Cup, L, Bendigo Cup, L, ATC Grand Pavilion H., Vale Mal Barnes H., 4th ATC WJ McKell Cup, L.
THINKIN' BIG (15g, Tale of the Cat, Nothin' Leica Dane). 4 wins-2 at 2-from 1100m to 2000m to 2018-19, A$487,845, ATC Gloaming S., Gr.3, MRC Caulfield Classic, Gr.3, ATC Owners Recognition Raceday 2YO H., Spring on Sale 2YO P., 3d ATC Spring Champion S., Gr.1, Theraces 2YO H.
TOP OF MY LIST (12f, Belong to Me, Quack). 4 wins from 1300m to 2000m, A$275,210, ATC Japan Racing Association P., Gr.3, Lord Mayor's Cup, L, Pluck at Vinery P., Pluck at Vinery H., 2d ATC Schweppes H., TAB Rewards H., 3d ATC Epona S., Gr.3. HI WORLD (11c, Danehill Dancer, Lord Seymour). 4 wins from 1400m to 2000m, A$341,025, ATC Carbine Club S., Gr.3, Frank Packer P., Gr.3, Tab.com.au H., 2d VRC Saintly H., 3d VRC Sofitel H., L, Carbine Club 2YO P., 4th VRC Carbine Club S., Gr.3. HIGH HEELED (06f, Turtle Island, Assert). 4 wins-1 at 2-from 1m to 1½m, £156,424, €66,199, Newbury St Simon S., Gr.3, York Lyric S., L, Newbury Golf World Cup S., 2d Deauville Prix de Pomone, Gr.2, Longchamp Prix de Royallieu, Gr.2, Newmarket Route Nightclub 2YO S., 3d Epsom Coronation Cup, Gr.1, The Oaks, Gr.1, Haydock Lancashire Oaks, Gr.2, 4th Newmarket Pride S., Gr.2, York Musidora S., Gr.3. MONTOYA STAR (12f, Cape Cross, Straight Strike). 9 wins from 1400m to 2000m to 2017-18, NZ$184,597, WRC Cuddle S., Gr.3, Hawkes Bay Karaka Million H., Otago RC Harcourts H., McCraw Farrier H., WRC Majestic Horse Floats H., CJC Speight's Mid Ale H., 2d CJC Canterbury Breeders S., Gr.3, David Emerson Accountant and Business Consultant H., 4th ARC Westbury Classic, Gr.2. RED ALTO (12g, Fastnet Rock, Diesis). 7 wins from 1100m to 2400m to 2018-19, A$603,060, Bendigo Cup, Gr.3, ATC Cindy Sullivan Memorial H., VRC Stayers Lounge H., MVRC Quest H., 2d MVRC Telstra Business Centre Dandenong 2YO H., SAJC Medallion Homes H., Quayclean H., Evright H., 3d Bendigo JC Golden Mile, L, MRC David Hopwood 2YO H., ATC Bob Ingham H., SAJC Hughes Limousines H., MRC Ladbrokes H., 4th Victoria Derby, Gr.1. NEW TIPPERARY (12g, Danehill, Assert). 7 wins from 1350m to 1900m to 2018-19, A$456,975, Newcastle JC Cameron H., Gr.3, ATC November Topaz H., Blacktown Workers H., McGrath Estate Agents H., Pro-Ride H., 2d ATC Ajax S., Gr.2, Turner Freeman H., 4th ATC Japan Racing Association P., Gr.3, Scone Cup, L.
MANGAROA FLO JO (10f, Casual Lies, Dealer's Choice). 7 wins from 1600m to 2100m to 2017-18, NZ$145,170, Manawatu Breeders S., Gr.3, BOP RC Barrett Homes Making Things Happen H., ARC Ecochill H., Taranaki RC ITM Interprovincial H., Stella Artois H., Platinum Homes H., 2d Avondale JC Ritchies Coachlines H., WRC Haight Ashbury H., 3d ARC Dunstan Feeds Championship Qualifier, Waikato RC Carpet Mill H., Taranaki RC ITM Interprovincial H.
FRANCALETTA (12f, Arazi, Thatching). 6 wins to 1400m to 2017-18, NZ$161,500, A$18,300, Egmont RC Taranaki Breeders S., Gr.3, ARC Auckland Co-Op Taxis H., Hawkes Bay Stella Artois S., Telperion Trophy, 2d Counties RC Auckland Thoroughbred Breeders S., Gr.2, 3d ATC Guy Walter S., Gr.2, 4th Waikato RC Foxbridge P., Gr.2. MONGOLIAN MARSHAL (14g, Dehere, Danehill). 5 wins from 1400m to 2400m to 2018-19, NZ$209,500, A$28,900, Waikato Cup, Gr.3, ARC Carbine Club Trophy H., Buffalo & Co S., Hawkes Bay Bay Ford Punter of the Year H., 2d Counties Cup, Gr.3, ARC Karaka Cup, Hawkes Bay Hastings-Hawke's Bay H., 3d ARC City of Auckland Cup, Gr.3, 4th ATC Tulloch S., Gr.2. HIGH SEAS BEAUTY (13f, Belong to Me, Imperial Prince). 5 wins from 1200m to 1600m to 2018-19, R545,125, Turffontein Acacia H., Gr.3, Vaal Racing Association H., Full Dividend No Limits H., Turffontein Tabonline.co.za H., 2d Vaal Computaform H., Turffontein Saturday Citizen H., 3d Turffontein Gauteng Guineas in February H., Champions Day in May H., Vaal Full Dividend No Limits H., 4th Turffontein Jacaranda H., L.
I'M A PRINCESS (13f, Pentire, Virginia Privateer). 5 wins from 1400m to 1950m to 2018-19, A$221,450, MRC Summoned S., Gr.3, SAJC Goldin Farms H., MRC Dream Thoroughbreds H., 2d ATC Epona S., Gr.3, SAJC Kitty Kat Pastoral H., 3d SAJC Mypunter.com H.
CISMONTANE (12g, Volksraad, Sir Tristram). 5 wins at 1600m, 2500m to 2017-18, A$443,675, VRC Lexus S., Gr.3, MVRC McMahon's Dairy H., 2d ATC Davali Thoroughbreds H., Turf Club H., MRC Chef's Hat H., Le Pine Funerals H., 3d Moonee Valley Gold Cup, Gr.2, ATC St Leger S., Ranvet H.
His sire sons include So You Think (17), Dundeel (7), Tai Chi, Redwood, Monaco Consul, Golden Sword, etc. "This is a beautiful colt, with a lovely attitude. Great conformation and temperament. Everything a serious horse needs." "I genuinely think that Free Eagle is the best horse I have ever ridden." Seven-time champion Irish jockey Pat Smullen, having piloted FREE EAGLE on all his starts. Winner of the Group One Prince of Wales Stakes (2000m) at Royal Ascot in 2015. A race previously won by such champions as So You Think, Ouija Board and Dubai Millennium. Beating The Grey Gatsby, Criterion, Gailo Chop and three other Group One winners. Beat two subsequent Group One performers when winning his 2YO Maiden by 5 1/2 lengths on debut. Emphatic 7 lengths winner of the Group Three Kilternan Stakes (2000m) as a 3YO. Of all High Chaparral’s Group One winners, FREE EAGLE is one of only three to be stakes-performed as a two-year-old, three-year-old and four-year-old. Rated above the likes of Adelaide, Toronado, Dissident and Admire Rakti as a 3YO. Timeform Ratings 2014. Upon retiring as a four-year-old, FREE EAGLE was given a Timeform rating of 128, rating him above the likes of Criterion, Winx, Exosphere, Mongolian Khan and Brazen Beau. Timeform Ratings 2015.